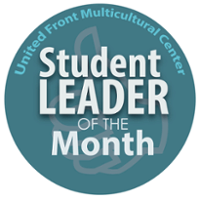 The UFMC Student Leader of the Month recognizes one student each month for their outstanding leadership and demonstrated commitment to diversity efforts at USD. To acknowledge the selected students, a special announcement goes out in the UFMC Newsletter and social media accounts. In addition, the students are highlighted throughout the month on the UFMC bulletin board and Weekly Newsletter. Submissions must be sent by the 25th of each month. Please consider nominating one of our many outstanding students for this honor.